Australia’s largest group of independent parks ‘Top Parks’, continues to make its presence felt in the marketplace, welcoming new parks from Victoria and New South Wales. 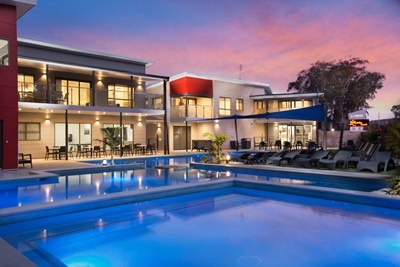 Middle Rock Holiday Resort at Port Stephens in the Hunter region and Lake Burrumbeet Caravan Park near Ballarat have made the move to Top Parks. Top Parks Executive Chairman Richard Emerson says we embrace the independence of our parks, while offering them the comfort of knowing they have the operational and marketing advantage that comes with being part of a larger group. “With three different styles of parks -Top Caravan, Holiday and Resort – our over 200 operators can choose which park best suits their offering. “Top Parks is known for having the most parks in the most places and so it’s very exciting for us to be welcoming another two new parks in Middle Rock Holiday Resort and Lake Burrumbeet Caravan Park. “It’s about expanding the quality and choice available to travellers Australia-wide, while offering a strong value proposition to those parks who choose to be part of the Top Parks family,” Mr Emerson says. 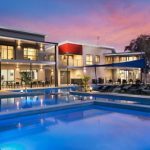 Situated in the picturesque Port Stephens area and only a two-and-a-half hour drive north from Sydney, Middle Rock Resort offers budget to luxury accommodation. The Top Resort is a popular wedding venue with beautiful beaches and Tomaree National Park right on its doorstep. Camping sites are pet friendly and guests are treated to resort pools with a heated spa as well as Rockpools Café Bar and Function Centre. Top Parks Middle Rock Holiday Resort owner Chris May says it was time for the park to align itself with a leading industry brand that’s in tune with various parks needs. “Top Parks can put us in the competitive space we are after, giving us access to customers through advertising, marketing and publicity opportunities, while also allowing us the freedom to run our own park,” Mr May says. 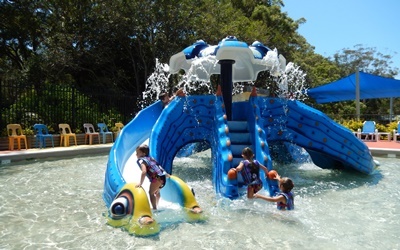 Guests at Top Parks Middle Rock Holiday Resort, can also take advantage of free Wi-Fi, Kids Club during the NSW school holiday periods, a jumping pillow, and waterslides. While during the cooler months of the year they can toast marshmallows on the open fire. Bottlenose dolphins call Port Stephens home and from May until November, the area plays host to migrating humpback whales. The Top Caravan Park is right next-door to Lake Burrumbeet near Ballarat, Victoria, famous for its gold rush history. Pet-friendly and popular for its camping facilities, guests can enjoy fishing, tennis, swimming, boating, water skiing, bird watching and indulge in award-winning local wineries and restaurants. The park also has a playground, trampoline, camp kitchen and covered barbeque areas.